Global energy policy is experiencing a renaissance. Policymakers around the world are facing a series of pressing energy challenges that extend far beyond the traditional focus on energy security to the sometimes competing challenges of climate change mitigation and energy poverty – what is often labelled the ‘energy trilemma’. Scholars have been slow to respond to these challenges with much of the academic literature located back in the 1970s when the oil shocks put energy policy firmly on the international agenda. However, this has now begun to change and recent years have witnessed excellent research on various parts of the energy trilemma, from a focus on the energy security implications of the US shale revolution, for example, to the climate implications of the plunging costs for renewable energy. The renewed focus on global energy policy has also been manifest in a handful of new books that have sought to clarify key questions (Fact and Fiction in Global Energy Policy, Benjamin K. Sovacool, Marilyn A. Brown, and Scott V. Valentine, 2016), or focus on particular challenges (International Handbook of Energy Security, edited by H. Dyer and M. J. Trombetta, 2013). 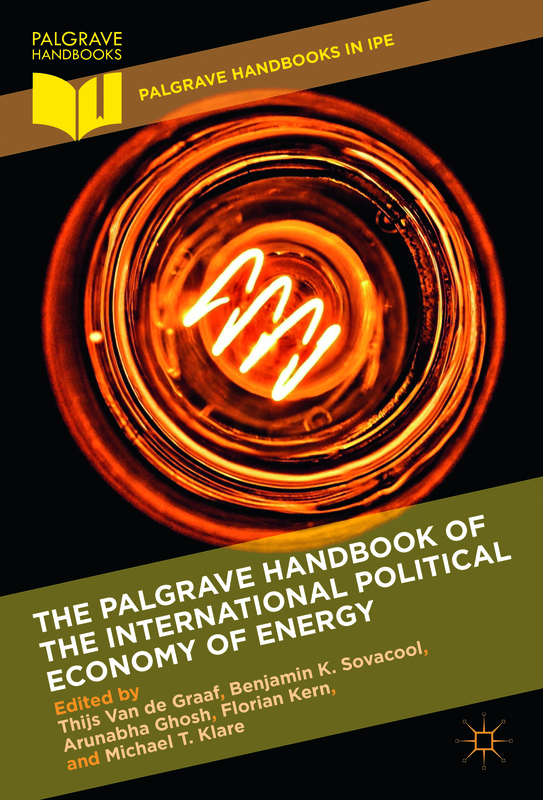 The Palgrave Handbook of the International Political Economy of Energy stands out from the pack. It does so not only because of its size and the fact that it brings together many of the leading thinkers in the field, but critically because it aims to do what many prominent scholars have long been calling for: bring energy into the field of International Political Economy (IPE). Why? Because as the editors in the opening chapter point out, the study of global energy policy continues to lack theoretical frameworks, something IPE is well-placed to offer given its focus on the relationship between politics and economics, and states and markets at the international level. The Handbook is organised into six parts. Aside from Part 1, which introduces the volume, each part contains a handful of chapters orientated around the topics of: energy actors and institutions; energy trade, finance and investment; energy transitions; energy conflict and the resource curse; and energy justice and political ecology. Across the chapters two lenses are employed, political economy, which the authors describe as where the market meets the state, and political ecology, where political economy meets the environment. As a researcher with an interest in the failure of the existing international architecture to address the energy trilemma, particularly the challenge of climate mitigation, I found the Handbook extremely valuable. For example, Part 2 begins with an excellent chapter that provides an introduction to the actors, institutions and frames that populate the fragmented global energy architecture. Subsequent chapters in this section helpfully narrow the focus onto key organisations, such as OPEC or the WTO. Understanding the role of these organisations in the domain of energy (and those not covered in the book, such as the G7 and the G20) is crucial to improving the governance of energy at the global level. The chapters that are strongest are those that more closely bring energy into the IPE field and/or introduce new theoretical concepts that could be built upon in future research. Fortunately for the reader, such chapters are in abundance, which is one reason it is likely to make a lasting contribution to the literature in this issue-area. For example, Chapter 11 on energy subsidies clearly and succinctly illustrates the political challenges associated with governing energy markets, even at the seemingly simplest of levels, defining what an energy subsidy is. Other chapters, such as Chapter 22, highlight the value of considering the literature on political ecology and energy justice alongside IPE, thereby offering up new theoretical concepts that are rarely applied to the domain of energy. Although the breadth of topics covered by the Handbook is a plus, the organisation of the book can seem unwieldy at times. For instance, it may have worked better if each of the sections were organised around theoretical concepts, which may have made it easier for readers to navigate the chapters. That said, this book represents an important contribution to the study of global energy policy. By bringing energy back into the field of IPE, it will prove an invaluable reference not only for scholars of energy seeking greater theoretical rigor, but also for policymakers who are often left grappling in the dark for the best way to manage energy at the global level given the lack of existing theories and concepts to turn to.